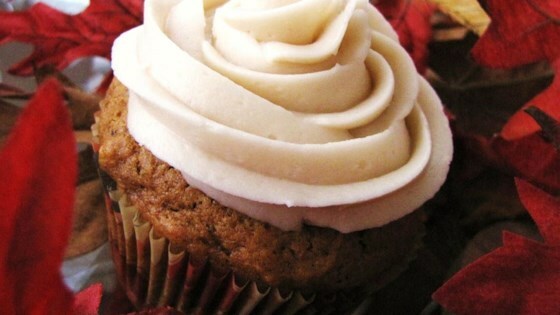 "A delicious, easy-to-make maple frosting, great on white cakes." Cream together the cheese and butter or margarine. Stir in the confectioner's sugar and flavorings. Mix well. Make this creamy frosting for your favorite cake recipe. Very good, with some minor changes. Only used 3 cups of confectioners sugar. Also used 1/2 tsp vanilla and 1 and 1/4 tsp maple. Everyone at work raved when I served it on spice cake. VERY quick and easy...my kind of recipe! Absloutely love this one!!! Went perfectly on the maple banana bread that I made into muffins. This was the perfect consistency for piping and was extremely easy to make.